The Israeli army has cleared an officer accused of repeatedly firing into the lifeless body of a young Palestinian girl of "unethical" behaviour. 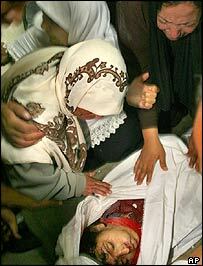 Hundreds of Palestinian children have been killed by Israeli troops during the Palestinian uprising or intifada. The killing of Palestinian civilians does not always make much news in Israel. And it is unusual for the army to launch an investigation into the circumstances of such incidents, says the BBC's James Reynolds in Jerusalem. Without revealing their identities, soldiers from the Givati brigade platoon told Israeli television how their officer sprayed Iman al-Hams with automatic gunfire on 5 October in the Tel Sultan neighbourhood of Rafah - a restricted area near Gaza's border with Egypt. "We saw her from a distance of 70m. She was fired at ... from the outpost. She fled and was wounded," a soldier said. While Iman was lying, wounded or dead, about 70m from the Israeli guard post, the platoon commander approached her and fired two bullets from close range at her head, the soldiers said. He then went back a second time, put his weapon on the automatic setting and - ignoring their objections on the walkie-talkie - emptied his entire magazine into her body. But the army says it accepts the commander's claim that he fired into the ground near the girl after coming under fire in a dangerous area. It has not explained why the officer shot into the ground rather than at the source of the fire. "The investigation did not find that the company or the company commander had acted unethically," an army statement said. "The investigation concluded that the behaviour of the company commander from an ethical point of view does not warrant his removal from his position." But the investigation criticised the officer's leadership abilities. "Due to these failures the company commander was suspended from his position, and his future career [in the army] will be decided upon in the course of the next week," the statement said. A separate military police investigation into the incident is continuing.